Has the following thought ever popped into your brain: “Gee, I sure would like a rhythm-based music game that’s like Amplitude mixed with Dungeons and Dragons!” You are indeed a strange person but it looks like you are not alone! 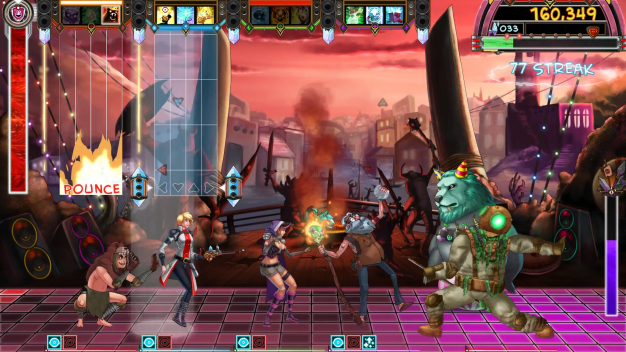 Akupara Games has released its new rhythm RPG title The Metronomicon: Slay the Dance Floor. Combining music, RPG, rhythm, and medieval themes, The Metronomicon mixes various genres to create a unique title that’s a fun time for solo or co-op play, provided you enjoy a bit of RPG grind and have some competence in rhythm-based videogames. 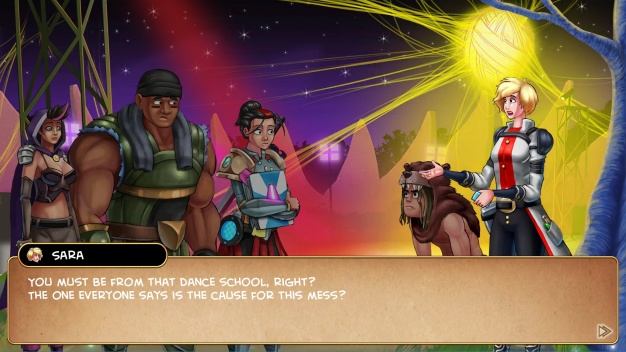 Metronomicon‘s story begins with four students graduating from The Neon Shield, a university that teaches the rhythmic combat arts. The four students; Violet, Wade, Gwen, and Clark; are your initial playable characters and they study an ancient text called The Metronomicon to harness magical powers and use them to defeat evil. Before being sent on your first mission together, The Grandmaster of the school gives you your final exams, which serve as the game’s tutorial level. After learning the basics; like how to switch between characters, your various magical and physical abilities, and how to hit the various notes on the screen without getting overwhelmed; your characters graduate and are off to explore the world in order to rid the land of monsters. Right off the bat, you’ll notice Metronomicon‘s art style. The title has a cute and colorful comic-like look, though the game is very scarcely animated and it’s incredibly obvious that Violet and Gwen have the same facial structure. Also, while the game has full voice acting, some of the actors are quite grating and the writing is hokey. That being said, when you are not watching a cutscene and playing an actual level, Metronomicon becomes more pleasant. Each stage sees your party grooving along to whatever song is being played while the enemies that appear to your right do the same. I especially love Clark’s geeky dance moves the most because they remind me of myself at the club, and adore how each enemy that shows up in a given stage has their own rhythm routine. Metronomicon also has a memorable selection of songs that range from bumping club music to guitar shredding rock. Controls are simple to grasp: the player can move from character to character with the left or right bumper and play notes by using the d-pad, control stick, or face buttons. Each note is displayed as an arrow facing East, West, North, or South, either by themselves or a combination of two. Personally, I did not like using a controller to play Metronomicon because its default setting using the bumpers to switch characters was too uncomfortable for me. Though the controller is customizable, I loved using my Rock Band 4 guitar instead because using the strum bar to switch players felt intuitive and it was easy to use the first four frets to hit each note. So what’s the objective of each level? Simple: destroy the enemies or boss until the stage ends without dying (the song in each level always fades out and doesn’t end definitively, which I found to be jarring). Most of your initial team deals either physical or elemental damage to enemies with the exception of Clark, who is the party’s healer. Some enemies have elemental weaknesses that a magic user like Violet can exploit, so you’ll want to cast your spells carefully. Each enemy has a lifebar next to them that depletes as you do damage; once it is empty, a new enemy will pop out for you to dispatch. 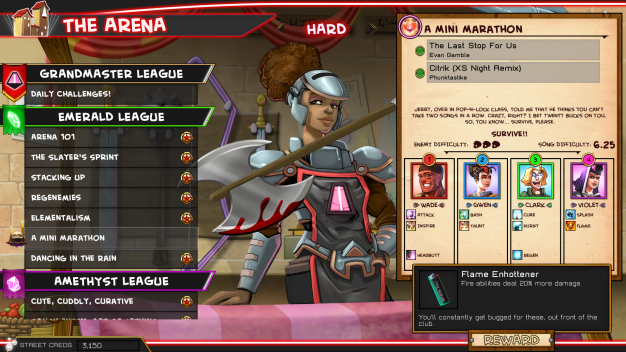 The party’s lifebar is all shared and is represented as a gauge on the left of the screen. Every world contains a boss stage that is exceedingly tough: boss characters will call out minions to dispatch, as well as mess up your note lane with such lovely modifiers like spinning arrows, distracting characters dancing in the foreground, forced lane changes, and notes disappearing before they hit the marker on the bottom of your character’s lane. FUN. You’ll encounter characters along your journey to add to the party; badass Sara here can both heal AND cast lightning! Conquering each level in Slay the Dance Floor depends entirely on how you use and equip your abilities. Every character starts out with two primary abilities that activate when you hit a certain procession of notes, a secondary ability that activates as long as you keep a consecutive beat, and a passive ability that is always active. Once a primary ability is used in battle, the character that cast it enters a cooldown state, which is your cue to switch to someone else. On each player’s note track is a colored outline: hitting all the notes in the blue outline and switching out casts your first ability, while hitting all the notes in the blue AND red outline automatically casts the second. 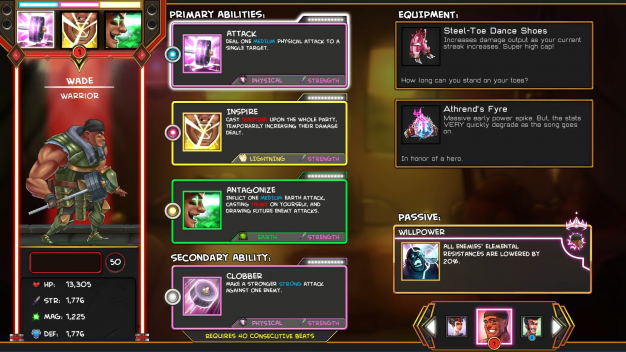 As you play through Metronomicon‘s Adventure Mode, you’ll gain levels and equipment. Equipment, some of which is character-specific and some of which can be used by anyone, will affect your abilities and stats, while leveling up will grant you different abilities. Special equipment can only be found in the game’s Arena, which is a mode where you must complete specific tasks with mandatory characters and equipment you cannot change. You’ll also gain street credits as you progress through the game that will help you rebuild the school and unlock extra goodies. Speaking of extra goodies, I was pleasantly surprised with how much content Metronomicon offers. There is a menu option that will allow you to play any DLC songs you have purchased (including a tune from one of my personal indie faves, Read Only Memories), an endless mode that unlocks after you beat the game that stacks various mods against you as you try to accrue battle points, and a co-op mode that can be played either on or offline. Co-op is a wonderful addition because each player can focus on different lanes to stack attacks and spells on top of each other. You can also highlight the same track in case you’re worried your friend might miss a note but this requires a zen-like level of commitment and concentration that very few humans possess. There were some elements of Slay the Dance Floor that hit me on a personal level due to my experience with rhythm games like Rock Band, both good and bad. One big plus in Metronomicon‘s favor is that it required no calibration for latency on my television. I cried tears of joy over this because I spent many a night getting Rock Band‘s latency settings just right. Using my Rock Band 4 guitar was also a godsend, though I wish legacy controllers worked, as well. Not everything Slay the Dance Floor offered clicked with me, however. For one thing, I did not like how enemy attacks were unclear when they were deployed; a consequence of having the player’s attention focused on the note bar. This vagueness caused confusion when I noticed I had to switch musical tracks, observed my life bar rapidly deplete, or saw notes spin and change direction. The game also starts off on Easy which was too much of a cakewalk for me because of my rhythm gaming experience. Thankfully, the difficulty can be easily changed before you select a song. Metronomicon also updated a lot during my playthrough which meant I had to wait upwards of fifteen minutes to start playing the title. These updates also caused the game to refuse to start, forcing a manual reboot. This can be due to my Xbox One being a launch model but anyone who has an older system should take note. Lastly, some of the later areas were so tough that it required me to replay older stages and grind my levels up to stand a chance of beating them. Diehard fans of RPGs probably won’t mind this because they are used to it but it’s good to know going into Slay the Dance Floor. 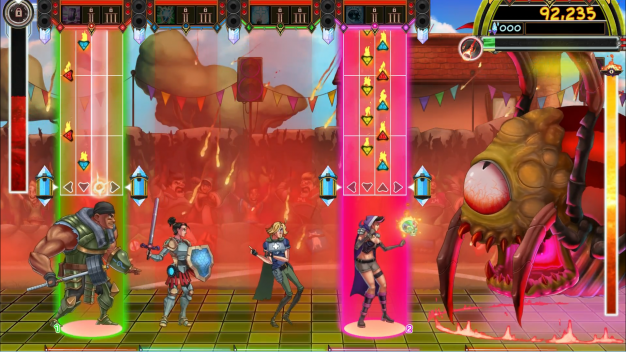 The Metronomicon: Slay the Dance Floor is a good game for fans of rhythm-based music titles. It’s rough around the edges, but when you play on a comfortable difficulty level that corresponds to your skill level, you really get into it and enter an almost hypnotic state where you ignore everything around you, including your friends and loved ones. This is always the mark of enjoyable rhythm gems like Rock Band, Amplitude, and DDR. If you love staying on beat, enjoy managing equipment and strategy, don’t mind some RPG grind, and the possibility you might need to play alone because your friends aren’t as well-versed in the rhythm genre, then give Slay the Dance Floor a chance. I guarantee you’ll have more fun playing it than trying your best to slay an actual dance floor in the club.